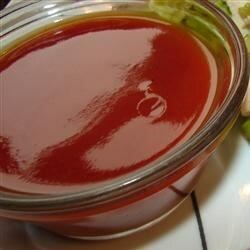 "This recipe has a lot of sweetness and spice, so if you're looking for a classic BBQ sauce that's easy to make, look no further. It is very popular with users of 'ceramic' type smokers and grills, (i.e. Primo, Kamado, Big Green Egg, etc.)" This will fill a 32 ounce ketchup bottle exactly. Cut back on the brown sugar to make it less sweet, or add more Worcestershire for more 'steak sauce' appeal.